Molar incisor hypomineralization (MIH) is a clinically challenging condition seen in as many as 20% to 40% of children’s newly erupted permanent first molars.1 Historically, re­storation of MIH-affected molars has involved invasive and expensive procedures which leave much to be desired for the patient and practitioner. Fortunately, an emerging minimally invasive treatment stands to revolutionize the clinical approach to treating MIH molars in an efficient and effective manner. These game changers are silver diamine fluoride (SDF) and high-viscosity glass ionomer cement (HVGIC). More concerning, resin products do not bond well to the hypomineralized surfaces, often leading to sealant loss, microleakage, filling fracture, and/or recurrent caries.1,7–9 For more severely affected molars, parents and caregivers have felt overwhelmed when presented with expensive and invasive treatment options, such as sedation, stainless steel crowns and/or extraction. It is promising to now have a new, minimally invasive treatment option for MIH — specifically, SDF and new-generation HVGIC formulations. This topical antimicrobial and remineralizing agent was cleared by the U.S. Food and Drug Administration in 2014 for the treatment of dentinal hypersensitivity. While its precursor, silver nitrate, dates back to the mid 1800s, SDF was developed in Japan in the 1960s and is widely used in caries management. Its chemical composition is 25% silver (which is antimicrobial), 8% ammonia (which acts as a solvent), and 5% fluoride (for remineralization). There is an abundance of scientific evidence demonstrating the efficacy of SDF, including 12 randomized clinical trials.10–21 A recent systematic review and meta-analysis found that the use of SDF is 89% more effective in controlling/arresting caries than other treatments or placebos, and the quality of evidence was graded as high.22 In just 60 seconds and with little more than a microbrush, SDF can deliver profound, long-lasting relief of hypersensitivity. This material occludes dentinal tubules, producing preferential fluorohydroxy­apatite and increasing mineral density and hardness.23 This is particularly advantageous for young, apprehensive children with MIH who would typically cringe at the sight of an air-water syringe. After taking a thorough patient history, including caries risk assessment, diet and nutritional counseling, a clinical examination is performed, followed by diagnosis, treatment planning, and an informed consent discussion. If MIH is identified, the condition is reviewed with the patient and parent/caregiver, including a discussion of the increased risk of caries (unless a lesion has already been diagnosed), along with assessment of hypersensitivity. This is done via patient report, as well as observation of the patient’s response to prophylaxis (e.g., observing whether he or she can tolerate rinsing or drying). 1. Protective eyewear and a plastic-lined bib are placed on the patient. 2. Petroleum jelly is applied to the lips and peri-oral area to prevent inadvertently staining the lips or face with SDF (any stain can be removed with hydrogen peroxide on a gauze or cotton pad). 3. The tooth should be clean and free from food or debris. 4. Isolate with dry-aides and/or cotton rolls. 5. Thoroughly dry the tooth. *Note: Patients with MIH typically cannot tolerate spraying with the air-water syringe, so dry the tooth with a 2×2-inch gauze instead. 6. Place one drop of SDF on a plastic dappen dish. 7. Dip a microbrush into the SDF and then apply to the tooth for one to three minutes. *Note: Do not allow SDF to touch the tongue or inflamed tissue, as it may cause a burning sensation. 8. Blot the excess SDF with gauze and coat the tooth with fluoride varnish. 9. Hypersensitivity symptoms should improve within 24 hours, though anecdotally some patients have reported same-day improvement of symptoms. 1. The patient is reappointed in two to four weeks. *Note: This allows time for the SDF to arrest caries and decrease sensitivity. It also allows the HVGIC to remain white, because even though it is self-curing, if it is applied the same day as the SDF, it will react with the free silver ions and turn gray. If HVGIC is applied and light cured the same day as SDF, the entire restoration and any surface contacted by the SDF will instantly turn black due to the light precipitating the silver out of solution. 2. Clean the tooth with plain pumice, rinse and dry. 3. Local anesthesia and rubber dam isolation are not necessary because SDF is an effective desensitizer and HVGIC is hydrophilic. 4. Prepare the carious surface following the principles of minimal intervention dentistry (Frencken24) and the atraumatic approach, whereby soft caries and unsupported enamel are removed via hand excavation with a spoon excavator and/or slow-speed round bur, conserving as much tooth structure as possible, and using caution not to expose the pulp. 5. Apply cavity conditioner (20% polyacrylic acid) for 10 seconds, rinse and dry, but do not desiccate. 6. Tap the glass ionomer capsule on its side to loosen the glass particles, push the plunger in, click the applicator gun once to activate, and then triturate for 10 seconds. 7. Immediately apply the HVGIC to the tooth. 8. Adapt the HVGIC to the grooves and/or cavity using a condenser or damp Q-tip and remove excess material. 9. Working time is a short: 1 minute, 15 seconds — however, this can vary with humidity. Use caution not to overwork or manipulate the material, as this may disrupt the crosslinking and the material could fail. *Note: In a dry climate, try not to work the material beyond 45 seconds. 10. Wait 2 minutes, 30 seconds for the HVGIC to set, then shape and adjust occlusion using copious amounts of water. 11. Apply the self-adhesive resin coat and light cure for 20 seconds. 12. Instruct patient to have a soft diet for 48 hours (sample postoperative instructions can be downloaded at kidsteethandbraces.com). An extremely apprehensive 7-year-old boy presented for a new patient exam. He had a history of severe pain in his molars, which made it difficult to eat, drink or brush his back teeth. 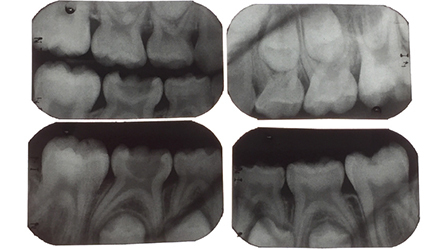 The exam revealed severe MIH and caries affecting all four of his first permanent molars (Figures 1A and 1B, and Figure 2), varying in International Caries Detection and Assessment System (ICDAS)32 scores from 1 to 4, as well as caries into the pulp on his mandibular right primary second molars, and an ICDAS 3 lesion on the distal of his lower left first primary molar. Treatment options for the MIH molars were discussed at length with the patient’s father, including: (1) oral conscious sedation and SSCs; (2) referral to an oral surgeon and orthodontist for extractions and second molar substitution; or (3) apply SDF and place interim therapeutic restorations with HVGIC. FIGURES 1A and 1B. Initial clinical presentation of a 7-year-old with severe molar incisor hypomineralization of his first permanent molars. FIGURE 2. 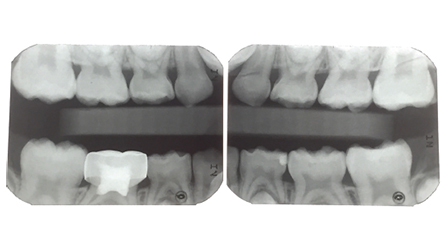 Initial bitewing radiographs of a 7-year-old with severe molar incisor hypomineralization of his first permanent molars. The patient’s father was overwhelmed by the idea of the invasiveness and cost of options 1 and 2, and decided to have SDF placed at the exam. The patient returned in four weeks and he and his father reported a dramatic improvement in the patient’s symptoms. All four of his first permanent molars were treated with the ART approach and restored with HVGIC. Definitive restorations were placed on his primary molars. The patient returned 10 months later and his HVGIC restorations were holding up well, and both the patient and his father reported that he no longer has tooth-related pain or sensitivity (Figures 3A and 3B and Figure 4). The father expressed that he was not interested in extractions and would prefer for his son to keep his teeth. In addition, he was aware these teeth would likely need full-coverage restorations in the future. FIGURES 3A and 3B. 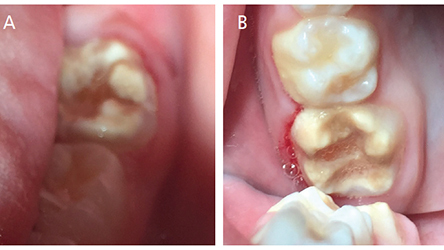 Clinical presentation at the 10-month follow up appointment of a 7-year-old treated with silver diamine fluoride (Advantage Arrest Silver Diamine Fluoride 38%, Elevate Oral Care) and high-viscosity glass ionomer cement (Fuji EQUIA Forte, GC America). The patient reported marked improvement in hypersensitivity symptoms (A). Note the improved gingival health now that the patient can tolerate toothbrushing (B). FIGURE 4. Bitewing and periapical radiographs at the patient’s 10-month follow-up visit. While these treatments may not be the final restoration, they can dramatically improve the patient’s quality of life and serve as an effective interim restoration until the family determines how to proceed (for example, with second molar substitution). Alternately, it can buy time until the child is older and can either have an SSC placed without the need for sedation, or even bypass an interim SSC and take the child into young adulthood when the patient can have an esthetic permanent crown placed. Regardless of the ultimate therapy, SDF and HVGIC represent a revolutionary minimally invasive treatment for MIH that deserves a place in any practitioner’s repertoire. An emerging minimally invasive treatment allows clinicians to treat molar incisor hypomineralization-affected molars in an efficient and effective manner using silver diamine fluoride (SDF) and high-viscosity glass ionomer cement (HVGIC). Compared to healthy enamel, affected molars have a 10-fold higher risk of developing caries, as this condition’s associated high porosity and low mechanical resistance lead to rapid enamel breakdown. It is important to note that application of SDF does not turn the entire hypomineralized tooth black — rather, only the areas with active caries lesions will stain. Another advantage of minimally invasive treatment with HVGIC is its opacity and ability to mask dark SDF stain without the need for removal of tooth structure — which increases the conservative nature of this approach. Grossi J, Cabral RN, Ribeiro AP, Leal SC. Glass hybrid restorations as an alternative for restoring hypomineralized molars in the ART model. BMC Oral Health. 2018;18:65. Hubbard M. Molar hypomineralization: what is the U.S. experience? J Am Dent Assoc. 2018;149:329–330. Pitiphat W, Savisit R, Chansamak N, Subarnbhesaj A. Molar incisor hypomineralization and dental caries in six- to seven-year-old Thai children. Pediatr Dent. 2014;36:487–582. Ozgül BM, Saat S, Sönmez H, Oz FT. Clinical evaluation of desensitizing treatment for incisor teeth affected by molar-incisor hypomineralization. J Clin Pediatr Dent. 2013;38:101–105. Hussein AS, Faisal M, Haron M, Ghanim AM, Abu-Hassan MI. Distribution of molar incisor hypomineralization in Malaysian children attending university dental clinic. J Clin Pediatr Dent. 2015;39:219–223. Rodd HD. Pulpal status of hypomineralized permanent molars. Pediatr Dent. 2007;29:514–520. Takahashi K, Correia Ade S, Cunha RF. Molar incisor hypomineralization. J Clin Pediatr Dent. 2009;33:193–198. Jälevik B, Klingberg GA. Dental treatment, dental fear and behaviour management problems in children with severe enamel hypomineralization of their permanent first molars. Int J Paediatr Dent. 2002;12:24–32. Lygidakis NA. Treatment modalities in children with teeth affected by molar-incisor enamel hypomineralisation (MIH): a systematic review. Eur Arch Paediatr Dent. 2010;11:65–74. Chu CH, Lo EC, Lin HC. Effectiveness of silver diamine fluoride and sodium fluoride varnish in arresting dentin caries in Chinese preschool children. J Dent Res. 2002;81:767–770. Zhi QH, Lo EC, Lin HC. Randomized clinical trial on effectiveness of silver diamine fluoride and glass ionomer in arresting dentine caries in preschool children. J Dent. 2012;40:962–967. Yee R, Holmgren C, Mulder J, Lama D, Walker D, van Palenstein Helderman W. Efficacy of silver diamine fluoride for arresting caries treatment. J Dent Res. 2009;88:644–647. Dos Santos VE Jr, de Vasconcelos FM, Ribeiro AG, Rosenblatt A. Paradigm shift in the effective treatment of caries in schoolchildren at risk. Int Dent J. 2012;62:47–51. Llodra JC, Rodriguez A, Ferrer B, Menardia V, Ramos T, Morato M. Efficacy of silver diamine fluoride for caries reduction in primary teeth and first permanent molars of schoolchildren: 36-month clinical trial. J Dent Res. 2005;84:721–724. Zhang W, McGrath C, Lo ECM, Li JY. Silver diamine fluoride and education to prevent and arrest root caries among community-dwelling elders. Caries Res. 2013;47:284–290. Liu BY, Lo EC, Chu CH, Lin HC. Randomized trial on fluorides and sealants for fissure caries prevention J Dent Res. 2012;91:753–758. Tan HP, Lo ECM, Dyson JE, Luo Y, Corbet EF. A randomized trial on root caries prevention in elders. J Dent Res. 2010;89:1086–1090. Monse B, Heinrich-Weltzien R, Mulder J, Holmgren C, van Palenstein Helderman WH. Caries preventive efficacy of silver diamine fluoride (SDF) and ART sealants in a school-based daily fluoride toothbrushing program in the Philippines. BMC Oral Health. 2012;12:52. Braga MM, Mendes FM, De Benedetto, Imparato JP. Effect of silver diammine fluoride on incipient caries lesions in erupting permanent first molars: a pilot study. J Dent Child (Chic). 2009;76:28–33. Duangthip D, Chu CH, Lo EC. A randomized clinical trial on arresting dentin caries in preschool children by topical fluorides, 18 month results. J Dent. 2015;44:57–63. Fung MH, Duangthip D, Wong MC, Lo EC, Chu CH. Arresting dentin caries with different concentration and periodicity of silver diamine fluoride. JDR Clin Trans Res. 2016;1:143–152. Chibinski AC, Wambier LM, Feltrin J, Loguercio AD, Wambier DS, Reis A. Silver diamine fluoride has efficacy in controlling caries progression in primary teeth: a systematic review and meta-analysis. Caries Res. 2017;51:527–554. Mei ML, Nudelman F, Marzec B, et al. Formation of fluorohydroxyapatite with silver diamine fluoride. J Dent Res. 2017;96:1122–1128. Frencken JE. The Art and Science of Minimal Intervention Dentistry and Atraumatic Restorative Treatment. Comberton, Orleton, UK. Stephen Hancocks; 2018. Fa BA, Jew JA, Wong A, Young D. Silver Modified Atraumatic Restorative Technique (SMART): an alternative caries prevention. Stroma Ed J. 2016;3:18–24. Bendit j, Young DA. Silver Diamine Fluoride: The Newest Tool in Your Caries Management Toolkit. Available at: dentalacademyofce.com/courses/3347/PDF/1707cei_Bendit_Young_web.pdf. Accessed October 10, 2018. Thompson V, et al. 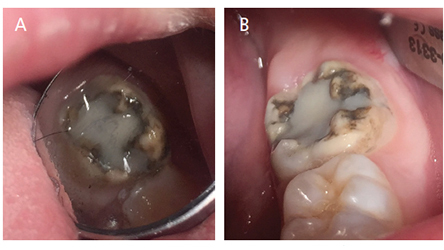 Treatment of deep carious lesions by complete excavation or partial removal: a critical review. J Am Dent Assoc. 2008;139:705–712. Ricketts D, Lamont T, Innes NP, Kidd E, Clarkson JE. Operative caries management in adults and children. Cochrane Database Syst Rev. 2013;28:CD003808. Schwendicke F, Frencken JE, Bjørndal L, et al. Managing carious lesions: why do we need consensus on terminology and clinical recommendations on carious tissue removal? Adv Dent Res. 2016;28:46–48. Schwendicke F, Frencken JE, Bjørndal L, et al. Managing carious lesions: consensus recommendations on carious tissue removal. Adv Dent Res. 2016;28:58–67. Innes NP, Frencken JE, Bjørndal L,et al. Managing carious lesions: consensus recommendations on terminology. Adv Dent Res. 2016;28:49–57. Gugani N, Pandit IK, Srivastava N, Gupta M, Sharma M. International Caries Detection and Assessment System (ICDAS): a new concept. Int J Clin Pediatr Dent. 2011;4:93–100. Zhao IS, Mei ML, Burrow MF, Lo EC, Chu CH. Effect of silver diamine fluoride and potassium iodide treatment on secondary caries prevention and tooth discolouration in cervical glass ionomer cement restoration. Int J Mol Sci. 2017;18:E340. Li R, Lo EC, Liu BY, Wong MC, Chu CH. Randomized clinical trial on arresting dental root caries through silver diammine fluoride applications in community-dwelling elders. J Dent. 2016;51:15–20. The author discloses that she has received honoraria from GC America, Oral Science, and Elevate Oral Care in the past for providing educational courses. From Decisions in Dentistry. November 2018;4(11):18–20,22–23. Jeanette MacLean, DDS, DABPD, FAAPD, owns and practices at Affiliated Children’s Dental Specialists in Glendale, Arizona. She lectures on minimally invasive dentistry, and is a diplomate of the American Board of Pediatric Dentistry and a fellow of the American Academy of Pediatric Dentistry. She can be reached at info@kidsteethandbraces.com.